What, you may wonder, do the people sitting in the front row at a fashion show talk about, as they're waiting for the lights to focus on the runway and that first model to appear in the new season's clothes? Well, if it's Paris Fashion Week, much of the chat is about hotels—where everyone is staying, how the breakfast compares, whether it's more efficient to travel there via taxi or metro. A few hotels count as superstars in the firmament of Paris' 1st Arrondissement lodgings, among these the Hotel Crillon. No wonder, then, that Valentino chose the Crillon as the setting for its oh-so-Parisian Fall/Winter 1994/1995 Haute Couture campaign. 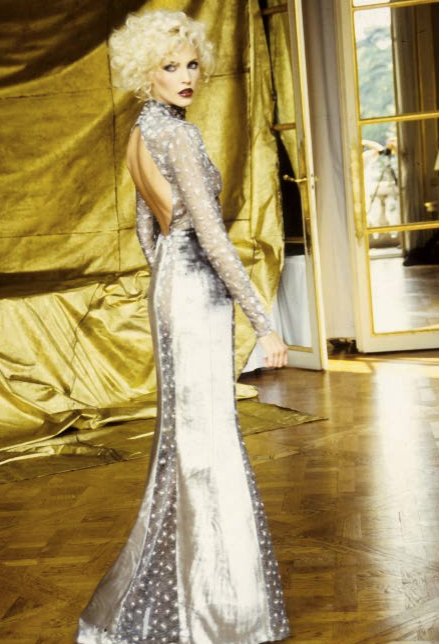 Shot by the legendary Arthur Elgort, and starring the also-legendary Nadja Auermann, the campaign conjures Paris at its most romantic and opulent. The Crillon's gold-tinted interior sets off gorgeous, body-skimming gowns of silver, black and signature Valentino red; meanwhile, a more urbane atmosphere pervades Elgort's outdoor shots of Auermann wearing looks for day and evening done in a military-inspired camouflage pattern. Only Mr. Valentino could reimagine the combat staple as a material for a bouffant ballgown skirt complete with its own cargo pocket, or as a bon chic, bon genre flak jacket with matching A-line miniskirt. Don't be surprised if flak jackets, cargo pockets and camo reemerge as trends at the upcoming Paris shows…and as for the Hotel Crillon, well, that place has never gone out of style.